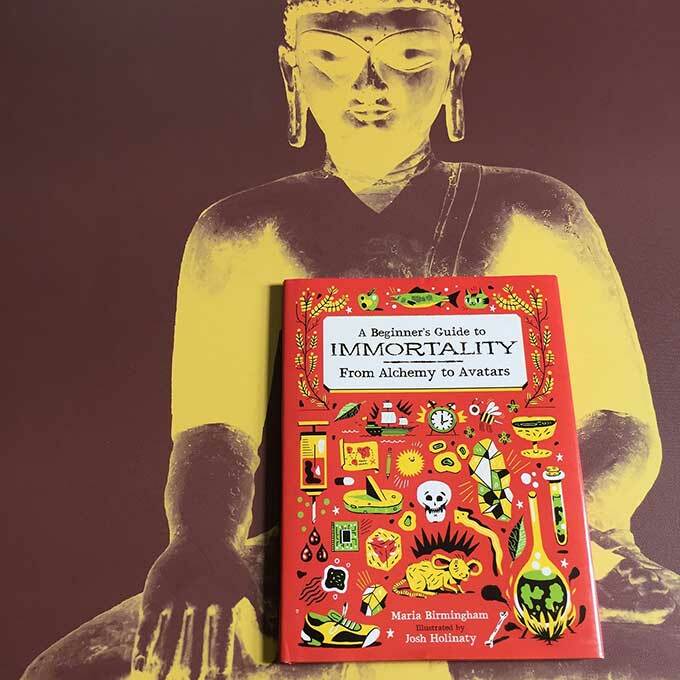 Featuring simple, bold, and colorful illustrations, A Beginner's Guide to Immortality examines humanity's never-ending quest to discover the secret to eternal life. 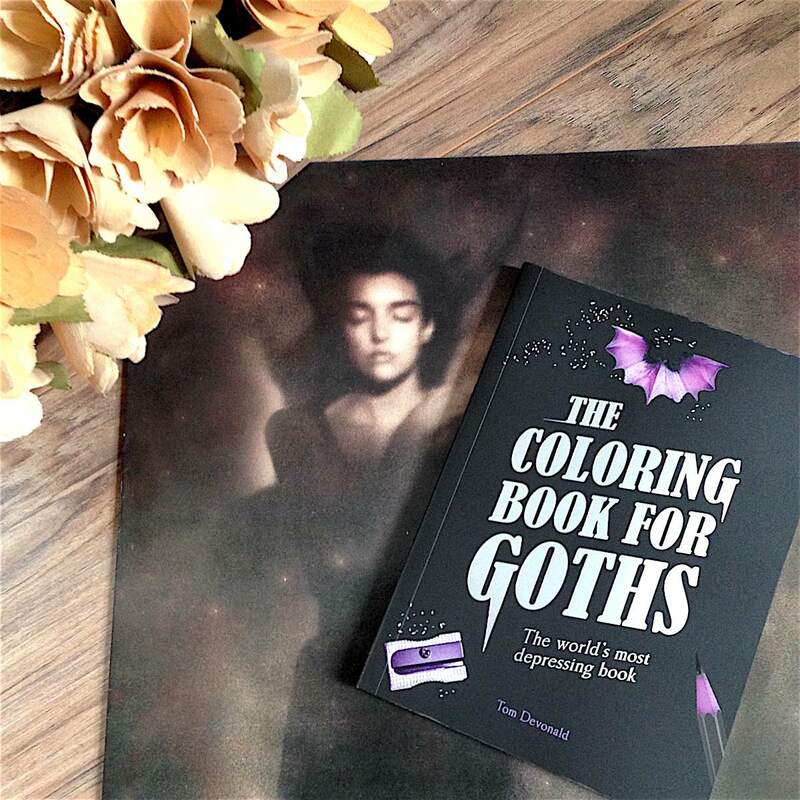 The book is categorized into five options on extending one's life: Elixirs, Meeting Immortals, Visiting Magical Places, Patience, and The Future. Starting with a look at historical figures such as Gilgamesh's search for youth-restoring seaweed and Qin She Huang's hunt for a fruit which grants eternal life, the book touches on the unsuccessful search for mythical life-extending tools like alchemical elixirs, the philosopher's stone, and the flesh of the ningyo fish. The folkloric Moon rabbit is shown is vibrant yellow, stirring its cauldron of the Elixir Of Life. The journey continues to mythical places where some form of a fountain of youth supposedly exists in Bimini, St. Brendan's Island, and Tir Na Nog. A dynamic full-page illustration of a maiden soaking in a mountain stream in bold aquamarine evokes an idyllic atmosphere. Real-life places such as those in Earth's Blue Zones occurring in Sardinia, Okinawa, and Loma Linda, California, where inhabitants regularly live to upwards of 90 years, are also investigated. Venturing into the realms of biology and other sciences, long lived animals such as naked mole rats, planarian worms, and a jellyfish known as turritopsis dohrnii are described. A gene that centenarians may possess known as FoxO is examined. Healthy routines like eating well, regular exercise, and flossing are suggested. A humorous full-page illustration of famous literary immortals is shown, featuring amazons, wizards, Pinocchio, and Dracula. 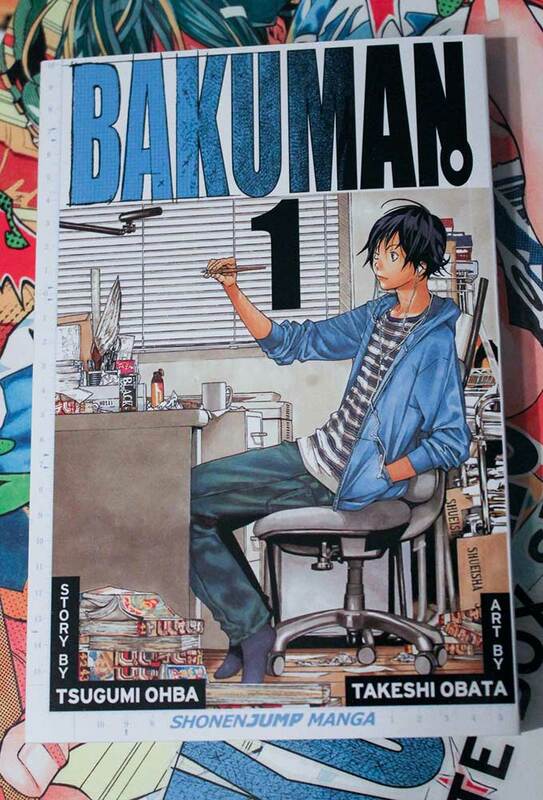 “Is becoming a successful manga artist an achievable dream or just one big gamble?” The back cover of every Bakuman. poses this question, the central question to a series about the highs and lows of professional art, and the troubles an artist has to endure for their work. In Bakuman., two high school students named Mashiro and Takagi team up to create manga, taking on the roles of artist and writer, respectively. They have different and unique motivations for pursuing this path, Takagi doing it to avoid falling into the trap of a boring life, while Mashiro endeavors to impress the girl he loves. They’re both incredibly well developed characters that struggle, win, lose, and never accept defeat. 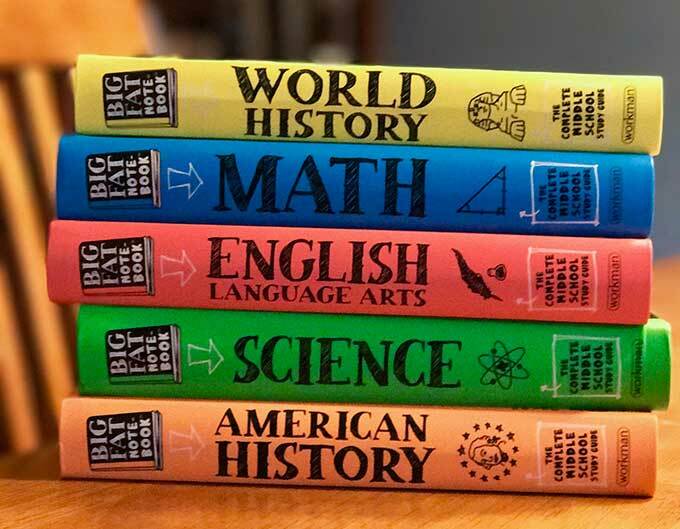 Over the course of the 20 volumes in this set, we’re offered an in depth chronicle of their attempts at success. Superman always left me cold. Virtually omnipotent, unerringly virtuous, and slightly boring, Superman is capable of rescuing kittens from trees, leaping over buildings with a single bound, and routinely saving the entire planet from certain cataclysm. He always wins. Sure, he was sort of killed once, he's been naughty on occasion (usually due to some form of Kryptonite or an alternate reality), and he certainly has a fascist streak in the current movies, but his most recent controversy is whether he's wearing the red trunks or not. Yawn. I was always fascinated by the C-squad heroes, the not-quite-ready-for-prime-time group just below Aquaman and Elongated Man in name recognition. Red Tornado, the 1940's heroine who fought crime while wearing a bucket on her head, utilizing only her fists and wit. Mr. Terrific, the Golden Age 'Man of 1000 Talents', who rarely used any of them. Phantom Stranger, a mage with omnipotent powers who was merely a narrator in his own book, generally only appearing in the first and last panels. And then there's The Legion Of Superheroes, whose members included Bouncing Boy, who had the ability to inflate himself and bounce around, Ferro Lad, who could turn himself to solid iron, and Matter Eater Lad, who could eat anything, which inspired the indie rock group Guided By Voices to write a song about him. 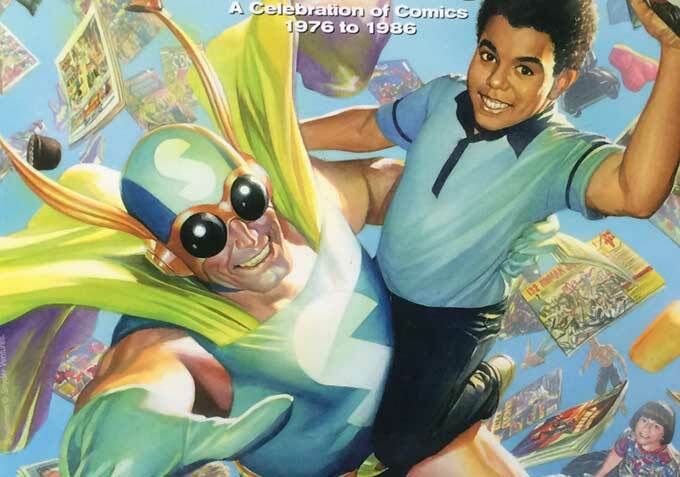 Don't even get me started on the League Of Substitute Heroes, the minor leaguers with questionable abilities not quite up to snuff to join the Legion. With over 4.3 million followers, Aimee Song is certainly the Instagram expert. Her debut book, Capture Your Style, aims to teach readers how to transform their Instagram photos, showcase their life, and build the ultimate platform. Whether you’re into snapping stylish outfits, delectable food, awe-inspiring architecture, or wanderlust-inducing travels, this book covers them all. 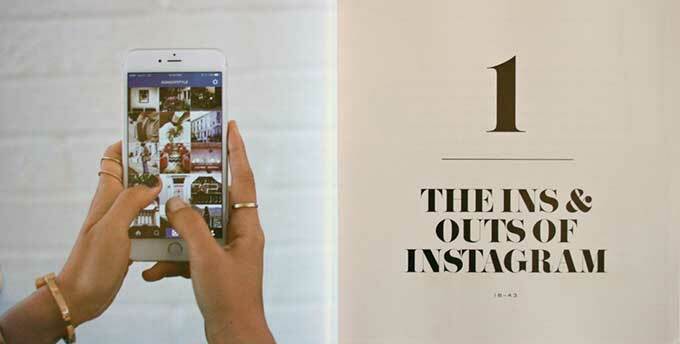 With sections about editing photos, hashtags versus geotags, curating the ultimate grid, working with brands, and pricing (just to name a few), Song’s publication is the all-in-one guide for those wanting to ‘up their Instagame’. Add-in pages upon pages of beautifully curated photographs from Song’s own Instagram feed and you’ve got yourself a publication that isn’t just educational, but pretty inspiring too. This is a must-read for individuals interested in pursuing the platform more seriously, particularly those who are bloggers or wishing to become social media influencers. 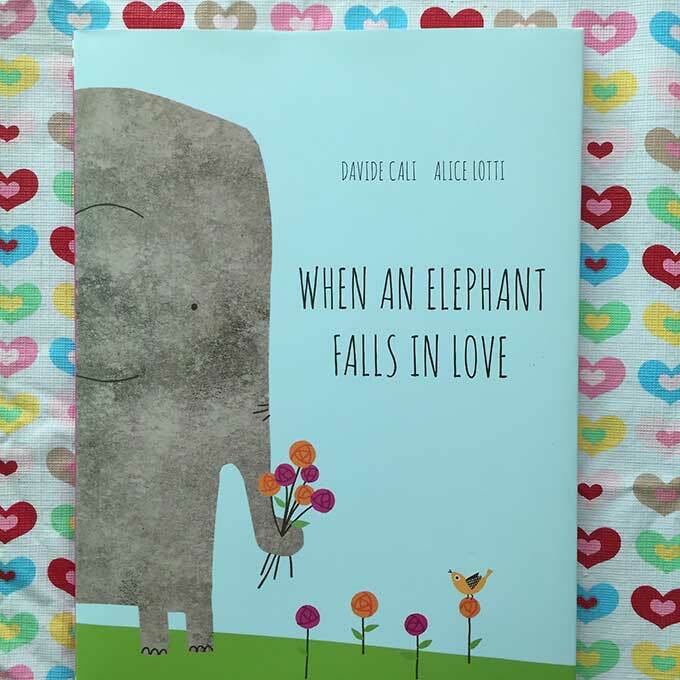 Award-winning children’s author, Davide Cali, teamed up with visual artist, Alice Lotti, to create When an Elephant Falls in Love, a book about the sweet and silly things one does for love. A no-named elephant works hard to impress the one he adores. He tries to eat healthy foods (no cheesecake! ), he takes daily baths (and washes behind his ears), he tries on stylish neckties, and he leaves flowers on a doorstep (but runs away before the door is opened). He’s unsure, confused, gleeful and sometimes sad. He’s normal. He’s in love. But does he enchant his beloved? Charming pen and ink illustrations accompany text that is understandable to children and truly relatable to adults as well. When you meet someone new, do you know what to say but still say the wrong thing? How much do you overanalyze everything that’s happening in your relationships? What do your brain, your heart, and your uterus think when their expectations of you are too high? 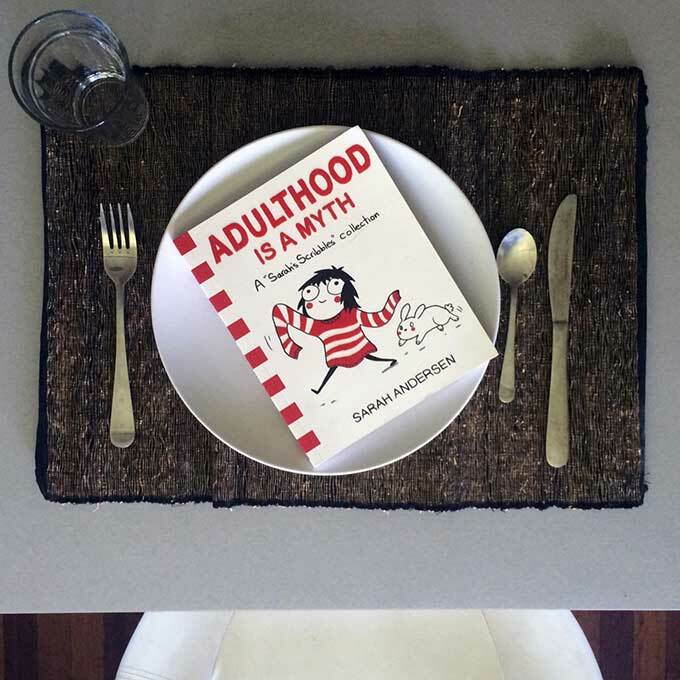 Adulthood is a Myth explores these questions and more in over 100 comic strips. Writer and artist Sarah Anderson compiled the best of her work from the online “Sarah’s Scribbles” collection and created plenty more comic strips to explain the insecurities and set back introverts face as they come into adulthood. These crisp black-and-white comic strips cover stressful situations like trying on clothes, being in crowds of people, obsessing over your flaws, and making the inevitable but always ill-advised comparisons to people who have figured out more than you have. Other comic strips show the unnamed main character having fun with her body fat, embracing her imperfections, and finding pleasure in little things like lying on warm laundry, wearing men’s hoodies, and embracing holiday costumes. If the title doesn’t make you want to pick it up, the fuzzy sweater on the cover might convince you. Read it all in one sitting or start wherever you’d like as you linger over the expressive drawings, wonder about the talking rabbit, and generally relax with the knowledge that the things that made you think you were weird and alone are universal among introverts. Attention, fellow mad scientists and monster creators! It’s time to put down our scalpels and electrodes and move into the twenty-first century. We need to upgrade our bio laboratories, transforming them into modern mechanical/electrical engineering labs. Anybody can pump several thousand volts into a creature created from spare parts. But, it’s the modern robot that gives us true control over every tiny detail of our creations, right down to the 1’s and 0’s of their digital brains. Imagine the horror and chaos that we can unleash with an army of mass-produced metal-monsters . . . mwa-ha-ha-ha-ha! Papertoy Glowbots is a collection of forty-six robot designs by fifteen notable papertoy artists from around the globe including the author, Brian Castleforte. 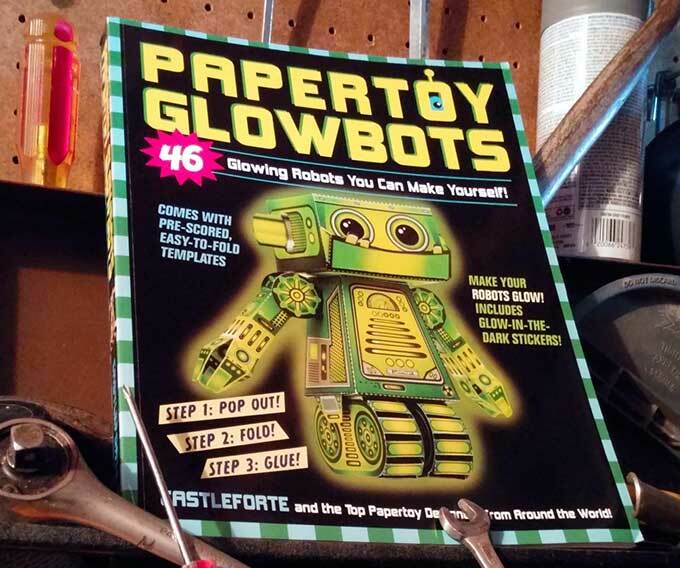 These robots glow, taking the previous book, Papertoy Monsters, a step further. Some have glow-in-the-dark stickers while others require the use of glow sticks, night-lights, or battery-operated tea light candles. One way or another, they have the ability to light up in some fashion. Every robot is printed on both sides, so the finished toy has colorful graphics inside and out. Pieces are perforated for easy punch-out, and they are pre-scored for easy folding. Even the slots are pre-cut for easy assembly (no dangerous craft knives to contend with). Construction difficulties range from easy to advanced, and is recommended for everyone nine years or older, but my seven-year-old nephew gets a kick out of them too. If you're an aging comic book fan, say in your late 40s or early 50s, Comic Book Fever will scratch the hell out of any nostalgic itch you've ever felt about the hobby. George Khoury's picture-heavy examination of comics and comics culture from the mid 1970s to the mid 1980s triggers a flood memories. There are the comics themselves: Landmark runs of the X-Men, Teen Titans and Daredevil. And the artists: Frank Miller, George Perez and John Byrne. Not to mention all the ads, toys and snacks. Remember ROM Space Knight, Big Jim and Micronauts? And all those superhero ads for Hostess Twinkies? Or the classic Jack Davis-illustrated ad for Spalding basketballs featuring Rick Barry and Dr. J? 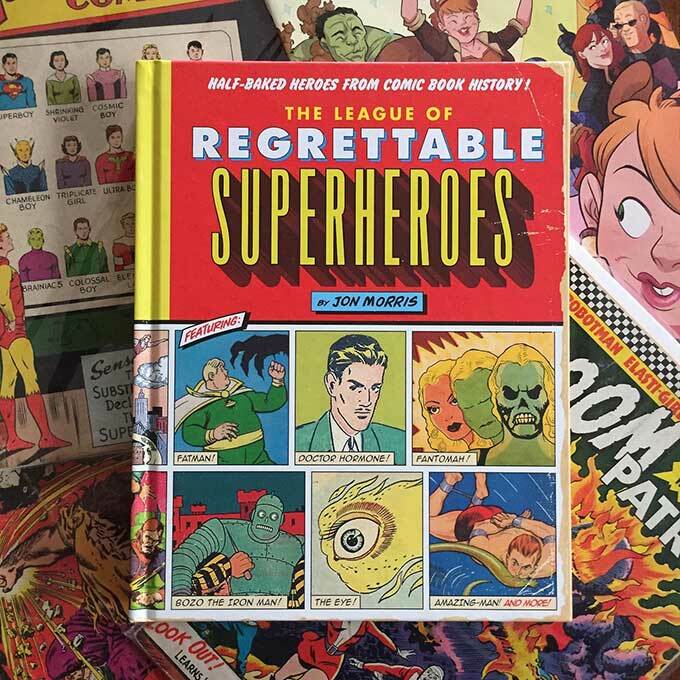 Heck, this book even includes a feature on Grit, the family newspaper that lured generations of comic fans into selling its tabloid door to door with the promise of cash and prizes. There are also features on such classic stand-alone comics as Captain America's Bicentennial Battles by Jack Kirby; the first-ever DC-Marvel match-up, Superman Vs. Spider-Man, and the Neal Adams-illustrated Superman Vs. Muhammad Ali. They don't make 'em like that anymore. And that's the point. 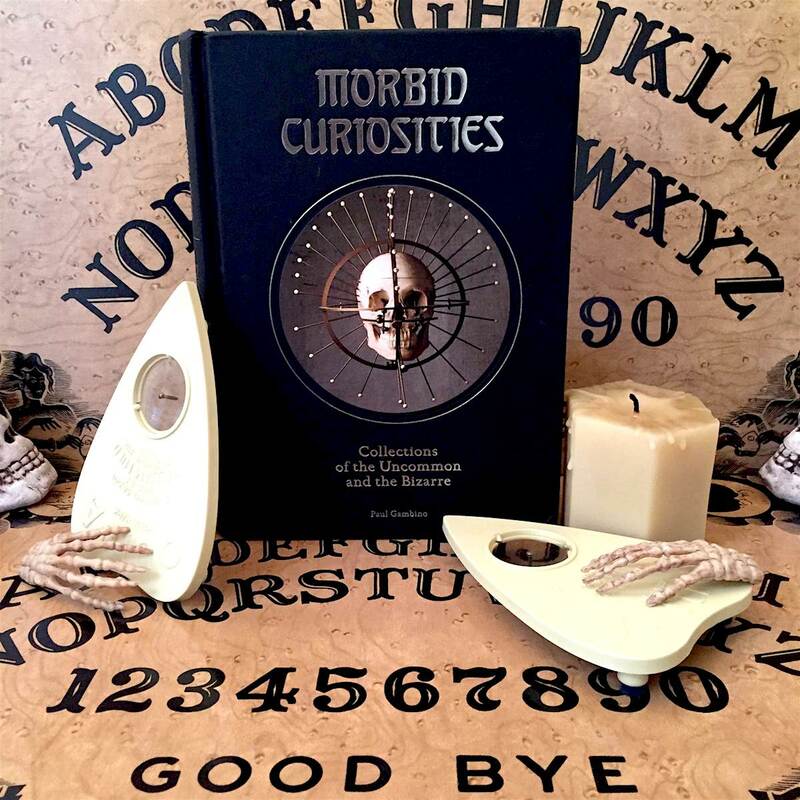 Dark and delightful, artistic and unusual, Morbid Curiosities: Collections of the Uncommon and the Bizarre is a glimpse into 18 fascinating collections of oddities. But more than that, it is also a collection of the collectors themselves. Author Paul Gambino’s familiarity with these traders of the macabre has granted him access to their greatest finds and most beloved possessions and in turn into their psyches as well. We are talking about the types of things that most of us don’t encounter grouped together outside of museums: Jars of diseased organs and the owner’s own placenta; shelves of human skulls of various shapes and histories; exhumed items; masks; ephemera; the letters and art of serial killers; antique wax anatomical dummies; shrunken heads and mummies; parts of deformed people and animals; vintage prosthetic devices; poisons; Ouija boards and séance contraptions; a hangman’s record book and tape measure...and the list goes on. Gambino presents the collections to us succinctly, with great visuals and a thoughtful introduction. And in doing so, he also presents to us a look at the folks who champion these items, who go to the ends of the earth to acquire them, who save them from garbage bins and bonfires, and who display them lovingly, beautifully, as objet d’art. When I think of Peter Bagge, I think of his work in Hate or Neat Stuff, both comics about teenage angst and living in suburban malaise. 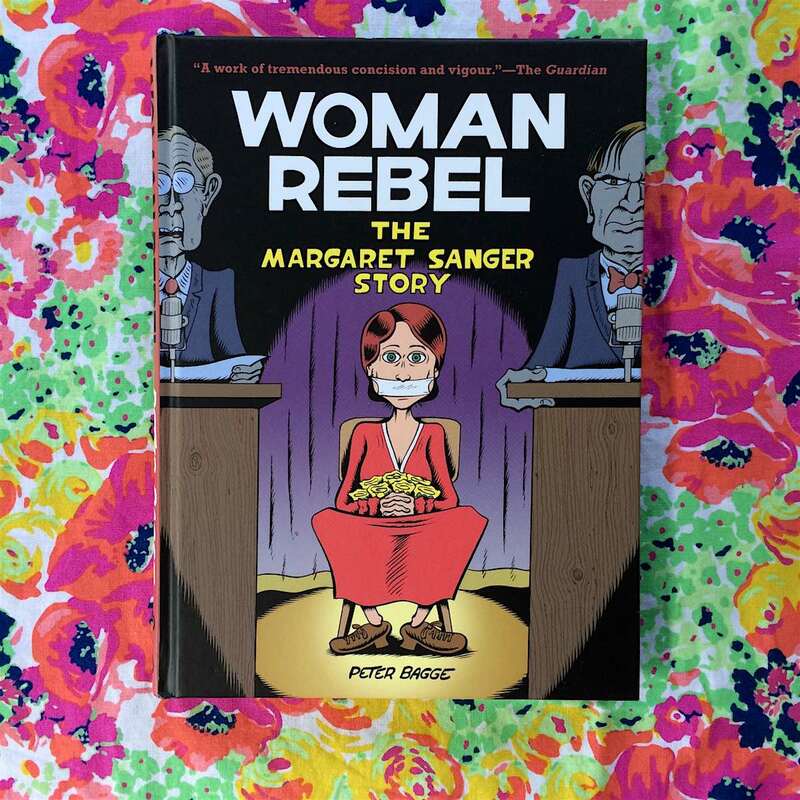 Therefore, when I saw he wrote Woman Rebel, a biography of Margaret Sanger (the woman responsible for Planned Parenthood), I was curious. Once I started reading, it made perfect sense. Discontent, anger, and frustration with the status quo translate perfectly to the life of Ms. Sanger. Margaret Sanger is most famously known as the founder of Planned Parenthood and for her endless fight for women’s access to birth control in the early 20th century. The book highlights key moments in Sanger’s life – it starts with her childhood (she was born in the 1880s to Irish immigrants) and takes us through her early work as a nurse, mother, and eventual activist. When it comes to dishing out all there is to know about living a creative life, Pip Lincolne is certainly your go-to woman. She’s the author of several creative titles and the talent behind popular blog Meet Me at Mike’s. She is also the founder of multiple inspiring projects, including worldwide craft group Brown Owls and the eMag series The Good Stuff Guide. 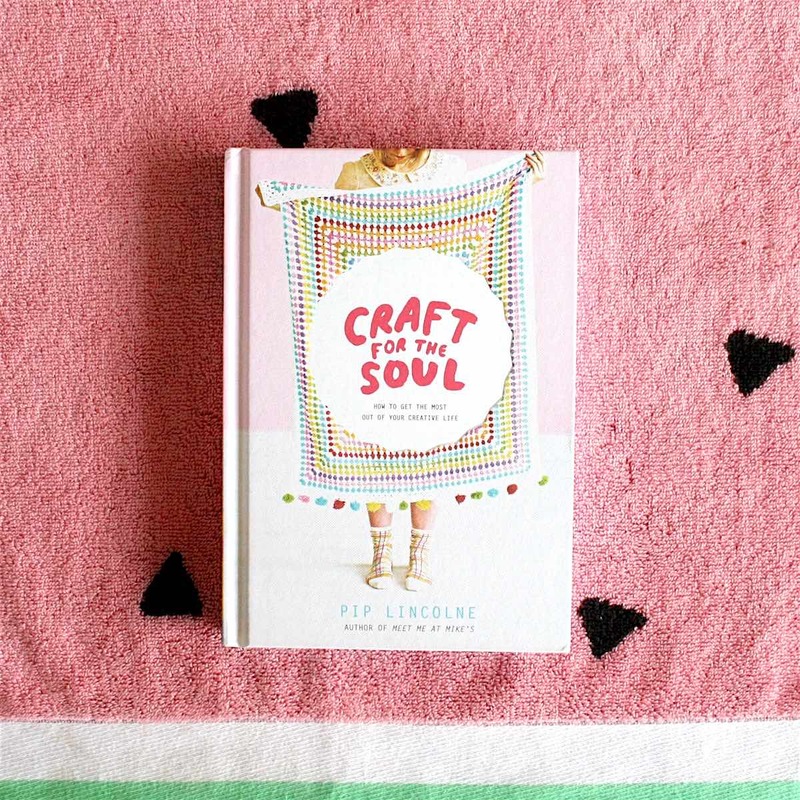 For some, stumbling upon Pip Lincolne’s book, Craft for the Soul, might seem a bit like discovering a rare gem. Sure, there are plenty of books about creativity, as well as numerous books filled with cute craft projects, but Lincolne has seamlessly blended the two to produce a book that is bursting with all things creative. Nestled among her down-to-earth advice about morning rituals, keeping active for creativity’s sake, and how to constantly generate ideas (among plenty of other topics), you’ll also find her favorite delicious recipes, along with adorable illustrations, inspiring quotes, and crafty DIY projects. I wasn't a big fan of high school, and my high school wasn't a big fan of me. Weird, awkward, and music-obsessed, I was a concert-tee-clad speck in a sea of polo shirts and boat shoes. My 30th high school reunion was last July. A friend of mine from high school, who has a sadistic sense of humor, added me to the reunion Facebook page. One of the organizers for the event asked the group what songs they wanted to hear at the reunion. They all commented with one singular word, "Eighties." The organizer tried their best to be diplomatic, and calmly asked which particular songs they wanted to hear, which then prompted the response of, "Eighties." This went on for a while. Finally, someone commented with Starship's "We Built This City." Chinese characters are wonderfully expressive, straddling the fine line between the written word and illustration. 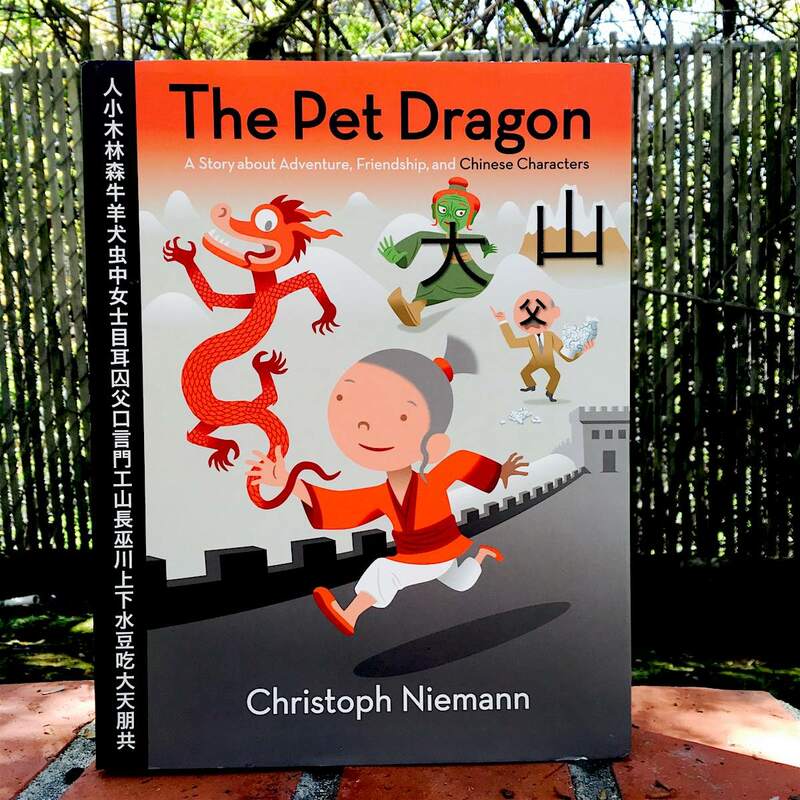 Esteemed graphic designer and picture book creator Christoph Niemann realized as much with The Pet Dragon, a whimsical story about a Chinese girl who raises a baby dragon to adulthood. In his introduction to the book, Niemann states that he had fun imagining connections between the calligraphic characters and their meanings. Reading the book, it’s clear that the author has a love of his subject and was very much enjoying himself. 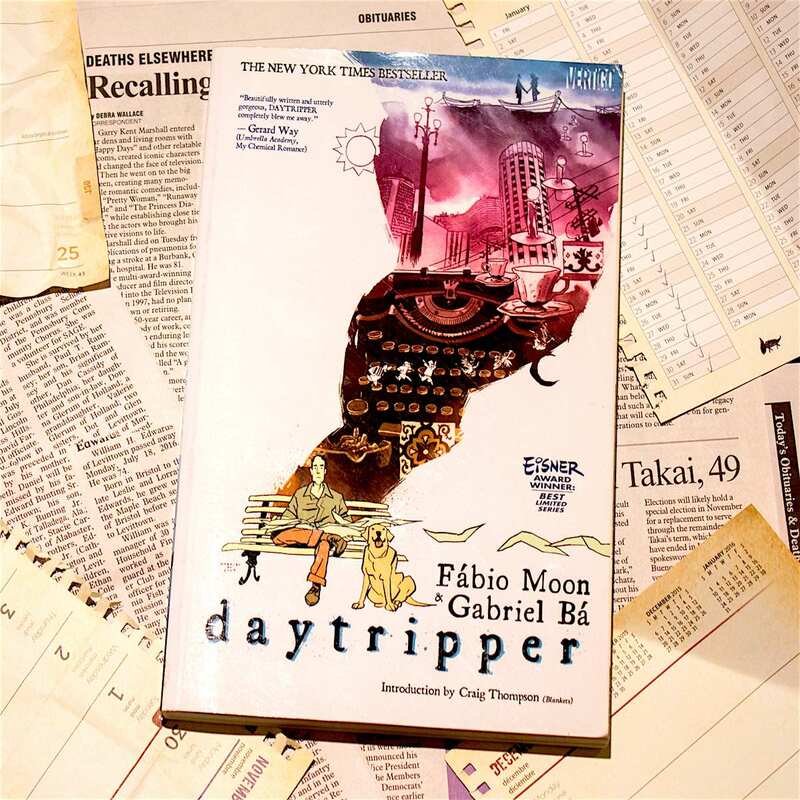 I don’t think it would be too hyperbolic of me to say Daytripper is one of the best graphic novels I’ve ever read. It’s a big story told in small moments. The epic, emotional core is powerful and life affirming, but brothers Fábio Moon and Gabriel Bá get there through the lightest touch of character. Without giving too much away (because there is so much to discover), the story is about Brás de Oliva Domingos, an aspiring novelist stuck writing newspaper obituaries. His life is both unique and unremarkable, and we meet Brás at a different age in each chapter. Theses ages are told in a non-linear fashion, and mostly feature life-changing moments. The twist is that these moments rarely seem life changing as they are happening, as is usually the case in real life. We live each day as if it is any other, only noting the important bits later. How has Superman’s logo changed shape since it was first created in 1938? How long do comic book characters tend to stay dead? How do the populations of fictional cities compare to New York City or London? 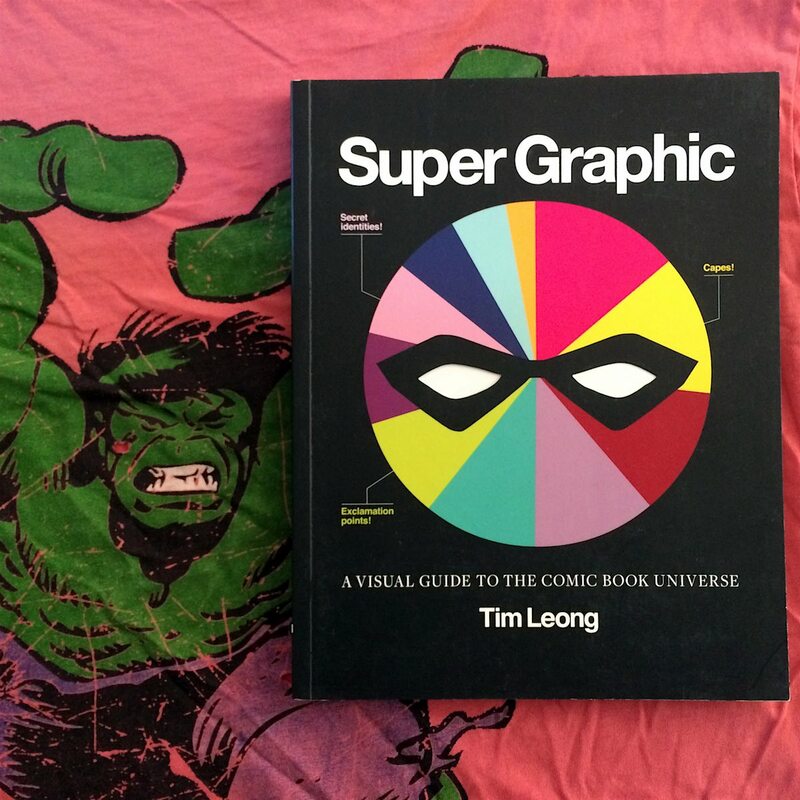 Tim Leong’s Super Graphic: A Visual Guide to the Comic Book Universe uses bright maps, word webs, graphs, and flowcharts to answer questions like these and illustrate correlations among different comic book characters. Most of his information comes from the usual Marvel and DC superhero comic books, but he also analyzes information from such classics as Tin-Tin, Peanuts, and Archie comics. A few years ago, I had the good fortune of discovering Noelle Stevenson's comics through an interview she did with Danielle Coresetto of the webcomic Girls with Slingshots. I read Nimona when it was available in full online and fell absolutely head over heels in love with the comic, blasting through it from start to finish in one sitting. When I revisited the site a few months later to show it to a friend, I was delighted to find out that it had been picked up by HarperTeen and was to be published later that year – no one deserved a publishing deal more than this incredibly talented illustrator and writer.